In January, I spoke about the special opportunity we have to not only celebrate the 25th anniversary of the first democratic election in post-Apartheid South Africa this year, but also to look forward to and to contribute to a more united South Africa. 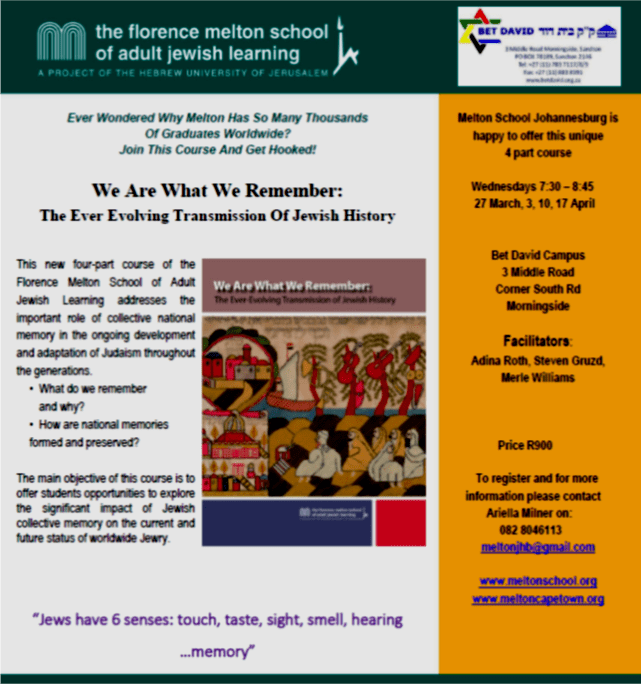 To “kick off“ our year of remembrance and celebration, we found a wonderful programme offered by the Melton School, which we are proud to be able to offer to you, the congregants of Bet David. will give the participants the opportunity to learn about the “Jewish way of remembering“ and how events in the past have shaped our collective identity. Please see the attached flyer “Flyer We are What We Remember at Bet David 2019″ or below for further details. Please note that we need a minimum of 15 participants to run the course.